Indoor Plants | Orchids | Best Blooms Plant Delivery Auckland N.Z. Indoor Plants - Flowering Plants - Orchids. Choose from stunning Orchids to pretty, flowering kalanchoe plants, a lush green leafy plant or Tropical Plant. 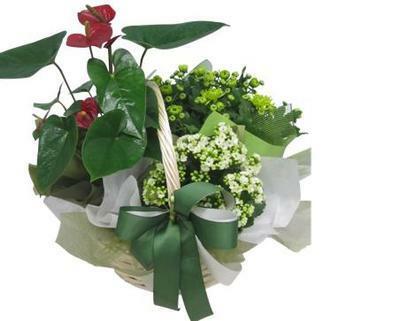 Pot plants are a caring and thoughtful gift to send and we can deliver Auckland wide. Send an indoor plant - the gift that keeps on growing! House Plants - Orchids, flowering plants, green pot plants. An indoor plant makes a great living gift for any occasion. We have a range of potted plants in stock, from Flowering Chrysanthemums, Kalanchoes, Cyclamens (in season), Poinsettia plants (at Christmas), Moth Orchid Plants (Phalaenopsis Orchids) as well as Tropical Anthuriums, and Peace Lillies which can all be delivered in Auckland, same day Monday - Friday if you order before 2.15 and before 9.30am on Saturday. People often prefer plants for delivery as they are longer-lasting gift - and some plants will last for years! Personalise your potted Plant - We can add balloons, chocolates, Teddy Bears, or even gardening gifts, together to make a planter gift basket or gardening gift box. Please call on 09 838 9058 if you wish to speak direct with our florists. Shop Online with Best Blooms and we can send a plant in Auckland today for you.